We have always been big into watching Disney shows and always look forward to when they have a new show. Its kind of like getting excited for a movie premiere for the little ones! Doc McStuffins was one of those we were excited when it first came out! The boys have learned to love her and all she does to help toys! 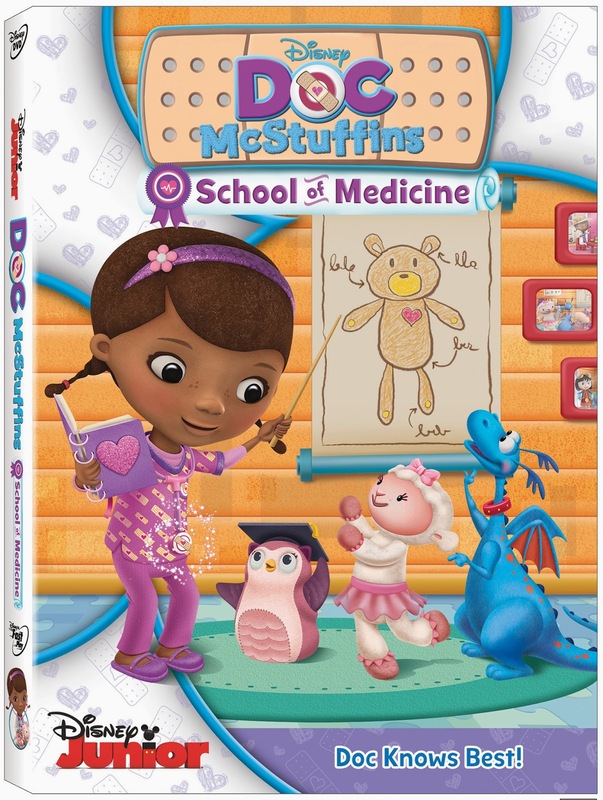 Doc McStuffins: School of Medicine, the third DVD compilation for Disney Junior’s hit animated TV series “Doc McStuffins,” was released on September 9, 2014. This couldn't have been released at a better time for my family as that was actually Declan's birthday. Being that he is the biggest fan of Doc, he has been watching it all weekend and telling everyone it came out just for his birthday. The DVD includes five exciting episodes and a FREE Doc McStuffins dress up playset for the lil ones to play with. The Synopsis says "In Doc McStuffins: School of Medicine, a compilation of engaging Doc McStuffins stories, the many specialties in which doctors practice medicine and health care are highlighted for young kids to comprehend. In her playhouse clinic, Doc is an optometrist, helping her stuffed owl toy, Professor Hoostburgh, to see clearly again. As a dentist, she fixes a tooth on Donny’s toy shark Mr. Chomp and, as a radiologist, Doc takes an inside look at Daisy’s arm after a Roller Disco fall. Then, Doc accidentally sprains her own ankle, so it’s up to her toys to provide the care and compassion to Doc herself and with rest, patience and plenty of cuddles, she will be as good as new, singing The Doc is in." I can tell you the boys loved this one! They've been watching it each night. Doc McStuffins is not only a lovable girl but the stuffed animals and toys are all such a great influences on the kids! Giveaway: Lionsgate is going to give one of A Lucky Ladybug's lucky readers Angelina Ballerina: Superstar Sisters DVD of their own!